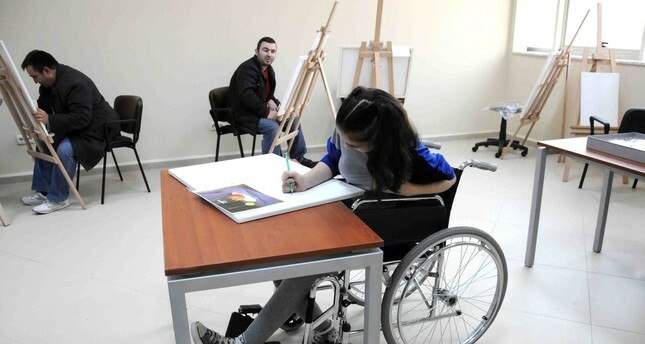 In collaboration with Bağcılar Municipality, Türkiye Beyazay Derneği (Turkey's White Crescent Association) is organizing a painting contest titled "This Canvas is Yours" for people with disabilities. The competition, which will accept applications until March 30, is open to Turks, refugees and foreign nationals from all age groups with at least 40 percent or more disabilities. Explaining the competition process, assistant professor Fatoş Altınbaş Sarıgül of Altınbaş University's Department of Sociology noted that she was very pleased to be part of the event. "We are currently accepting paintings from all over the world. This competition is not just limited to Turkey. Turkish nationals with disabilities living abroad can also join the competition and show their talent," Sarıgül said. The completion's jury is made up of Demet Sabancı Çetindoğan, Ahmet Güneştekin, Fatih Altaylı, Ertuğrul Özkök and Altınbaş. Upon the request of a jury member, painter Ahmet Güneştekin, the competition will be awarding more than just the top three paintings. "He did not want to select just three paintings because there are going to be many talented contributors. We liked his idea and maybe 40 or 50 paintings will be selected," she stated. Sarıgül noted that she was glad to be involved in a social responsibility project, saying, "As a society our problem was still finding people with disabilities odd." "I believe that disabled citizens should also have equal opportunities with everyone else. For example, there should be disabled access ramps on buses or special roads, which are included in the European Union accession laws," she said, adding that as Altınbaş University, they also want to create awareness in this regard. She also highlighted that disabled people can be born with extraordinary talents and they are striving to introduce and exhibit this to the public. The university has provided all required equipment and mechanisms for the disabled at their campus and the university strives to collaborate with nongovernmental organizations to cater to all project requests. "I believe we pulled our weight in this respect. As Turkish society, we need to be more open minded and positive towards the disabled, thus, enabling them to live a more peaceful life with their families," she concluded.